Many credit cards offer rebates and special discounts for spend at cinemas. If you’re a frequent movie-goer, you can easily take advantage and earn rewards with every ticket purchase. We’ve analysed and compared the best credit cards for movies below. If you’re a frequent movie-goer and want to earn cashback on ticket purchases, the following cards offer some of the highest rebate rates on the market. UOB YOLO Card is the best card on the market if you’re a frequent movie-goer seeking cashback on ticket purchases. Cardholders have access to great rates overall–up to 8% rebates on weekend dining, entertainment & Grab rides (3% on weekdays). Spend on online fashion and travel also earn cashback, though rates vary according to frequent promotions. These rates are unlocked after S$600 minimum spend, and cardholders can earn up to S$60/month. UOB YOLO Card’s 8% rebate on weekend entertainment includes spend at the movies, at any theater. However, if you’re willing to buy tickets at Cathay Cineplexes, you’ll earn an incredible 10% rebate. This boost is added via the UOB SMART$ Programme, which provides additional discounts up to 10% with select dining, grocery, retail, and leisure vendors. Ultimately, UOB YOLO Card is perfect if you frequently spend on entertainment, especially on the weekends, and want to maximise your cashback. UOB One Card is a great option if you consistently spend S$2,000/month. At this spend level, cardholders earn 5% rebate on all spend–including at the cinema–up to S$300/quarter. This means you can earn up to S$1,200/year, which is one of the highest earning potentials on the market. Lower and inconsistent spenders earn 3.33% flat rebate up to S$50 or S$100/quarter, depending on their minimum spend. UOB One Cardholders also have access to UOB SMART$ Rebate Programme. Spend with select merchants earns a boosted discount. In fact, patrons at Cathay Cineplexes earn an extra 2% boost, adding up to 7% in total cashback on movie tickets. Overall, spend with these vendors ‘double counts’–first towards determining your rebate tier, and then to earn SMART$ which offset future purchases. Ultimately, if you’re an average spender with a consistent budget and enjoy heading out to the movies, you can conveniently earn top rebates on all spend with UOB One Card. OCBC Frank Card is by far the best rebate card for social young adults, especially those on a budget. Cardholders begin earning after just S$400 offline spend–one of the lowest minimum spend requirements on the market. In addition, they’ll earn top rates of 6% cashback online and 5% for weekend entertainment & at select cafes (3% on weekdays). This entertainment rebate applies to spend at bars, KTVs, clubs, and cinemas, making it easy to earn on trips to the movies. OCBC Frank Card also stands out for offering a fee-waiver. Cardholders are exempt from the already low S$80.0 fee after just S$10,000 annual spend (about S$833/month). The closest competitor does not offer a fee-waiver, making it a bit less affordable. Overall, if you’re a lower or variable spender and don’t want to worry about high minimum requirements, you can enjoy top rebates–including on movies–with OCBC Frank Card. Only a select few miles-earning credit cards offer discounts for spend at the cinema. We’ve identified and reviewed the best options below. HSBC Revolution Card is the absolute best option for frequent movie-goers who want to earn miles for their ticket purchases. Cardholders earn 2 miles per S$1 spend on local dining and entertainment–including at local cinemas–as well as for online spend. Online transit and bill payments are eligible for rewards, which is quite rare–another reason to consider HSBC Revolution Card. There are no minimum spend requirements an no caps on earnings. There’s even a fee-waiver with just S$12,500 annual spend. Overall, if you want to earn miles for local movie spend, look no further than HSBC Revolution Card. If you want an easy-to-use travel card with great bonuses–plus movie ticket discounts–consider American Express Singapore Airlines KrisFlyer Card. Cardholders earn some of the best welcome bonuses on the market. Within the first 6 months, cardholders can earn up to 20,500 miles: 5,000 miles with their 1st charge, 15,000 after S$10,000 spend, 500 with their 1st Grab booking–and even S$150 SIA credit after S$12,000 spend. Cardholders also earn 1.1 miles per S$1 spend, 2 miles overseas in June & December, and 2 miles with SIA brands (SingaporeAir, SilkAir & KrisShop). Spend with Grab earns 3.1 miles per S$1, up to 620 miles/month. In addition, spend directly earns KrisFlyer miles, which are deposited into your frequent flyer account without the hassle of conversions or transfer fees. The reason that Amex SIA KF Card is a useful option for movie-goers is that cardholders have access to special promotions through American Express. These promotions often feature discounts on movie tickets. For example, cardholders have been offered S$1 off WE Cinemas 2D tickets. Very few miles-earning cards offer deals for movies at all. Ultimately, Amex SIA KF Card is worth considering if you’re interested in quickly earning bonus miles, with access to entertainment promotions. OCBC Titanium Rewards Card is not only the best card for retail shopping on the market, it also comes with discounts on movie tickets. Cardholders earn 4 miles per S$1 on fashion, electronics, at department stores, and with select retail merchants (Amazon, Alibaba, Lazada, Shopee, Qoo10 & many more). Given this vendor network, you can easily earn on everything from beauty products to appliances–online, offline, locally and overseas. Unlike its competitors, OCBC Titanium Card also comes with a variety of perks and a fee-waiver. Cardholders receive airport lounge access & complimentary access to JetQuay Quayside, plus discounts up to 15% off Cathay Cineplexes. Weekday tickets can be purchased for S$8.50, weekend tickets for S$11, and concession specials also receive combo discounts. This is compared to standard ticket fees of S$9 and S$13, respectively. This difference can add up quickly if you’re a frequent movie-goer, or often go to the cinema with your family. Finally, cardholders are exempt from the S$192.6 fee after just S$10,000 annual spend. If you want the best retail shopper card on the market, and also want access to cineplex discounts, OCBC Titanium Card is the way to go. Even if you have a small monthly budget, you can still earn rebates at movie theaters and discounts on tickets. Here are the best options with low minimum requirements and/or fee-waivers. Citi SMRT Card is an excellent option for lower spenders and young professionals on a budget. In fact, it is one of the few rebate cards on the market without a minimum spend requirement. Cardholders earn up to 7% cashback on groceries, 5% on fast food & coffee, 3% online, and 2% on health and wellness. Most of these categories are merchant restricted, but these merchants are quite popular–Sheng Siong, Starbucks, & Watson’s, to name just a few. Cardholders also receive 5% rebate on movie spend with a variety of vendors–Cathay Cineplexes, Filmgarde, Golden Village and Shaw Theatres. Many credit cards limit rebates to only 1 or 2 cinemas, or restrict high cashback rates to weekends only. In this light, Citi SMRT Card stands out as one of the most flexible options offering movie rebates on the market. Finally, Citi SMRT Card also stands out because it’s EZ-Link compatible and rewards 2% cashback on Auto Top-Ups. Most card exclude such transactions from earning rewards. Overall, if you want to immediately begin earning cashback without worrying about minimum requirements, you should definitely consider Citi SMRT Card. If you’re having trouble reaching high minimum spend requirements associated with most cashback cards, you may want to consider Maybank Platinum Visa Card. Cardholders earn 3.33% flat rebate, up to S$30/quarter, with just S$300 monthly spend. At this spend level, most cards offer base rates of 0.3% cashback. Additionally, Maybank Platinum Visa Card comes with an easy fee-waiver. The S$20.0 quarterly service fee is waived 3 years, and then simply with card use. In terms of entertainment, cardholders enjoy S$3 off movie tickets at Shaw Theatres. This discount can be applied across a minimum of 2, maximum of 4 tickets per day. Given the average ticket costs up to S$13 on weekends, this means you can receive up to 11.5% in discounts. While there are limitations to this perk, it still offers one of the best savings rates available. Overall, if you’re a very low spender, you’re most likely to maximise rewards for spend with Maybank Platinum Visa Card. Standard Chartered Rewards+ Card is worth considering if you spend S$250–S$350/month on dining & overseas, and still would like a few perks like discounts on movie tickets. Cardholders earn the equivalent of 2.9 miles per S$1 overseas and 1.45 on dining, with no minimum spend requirement. This is roughly equal to rebates of 2.9% and 1.45%, respectively. These rates are higher than those you’d receive with cashback cards at lower spend levels; they’re also slightly higher than the rewards rates you’d earn with travel cards in these categories. 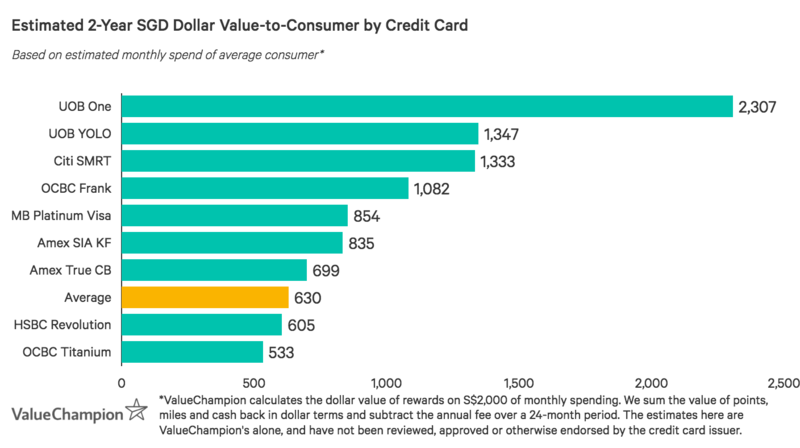 While SC Rewards+ Card is great for lower spenders, it’s not the best match for larger budgets. Earnings are capped at just 8,000 miles/year (equal in value to just S$80). Cardholders can max this out very quickly, losing rewards potential on all their additional spend. However, SC Rewards+ Card is also worth considering if you want access to movie perks, like 1-for-1 Cathay Cineplex Platinum Movie Suites tickets. Overall, if you’re looking to earn miles for a small overseas & dining budget, you may want to consider SC Rewards+ Card. Even high spenders enjoy movies–so if you want unlimited cashback as well as access to ticket discounts, you should definitely consider American Express True Cashback Card. Cardholders earn 1.5% unlimited cashback with no minimum spend requirement, boosted to 3% during the first 6 months (up to S$150). This is great if you’re planning on a few immediate, big transactions–perhaps planning a wedding or paying large hospital bills. Amex True Cashback Card also offers great perks, especially if you’re an Amex loyalist. Privileges include access to the Global Assist programme, Fraud Protection, American Express Selects dining privileges, and card-specific True Cashback promotions. These promotions often include cinema-related deals. For example, cardholders can enjoy S$1 off WE Cinemas tickets, with the purchase of at least 2 tickets. No other unlimited cashback card offers movie discounts. Ultimately, Amex True Cashback Card is a great choice if you’re a high spender seeking unlimited earning potential plus Amex benefits. Below, we've prepared a summary of our picks for the best credit cards for movie discounts in 2019. The graph below represents the approximate value-to-consumer (in SGD) of the best credit cards for movies in Singapore. Dollar values are calculated based on approximate rewards earned with a S$2,000 monthly spend for 2 years. This number varies, however, depending on individual spending habits.